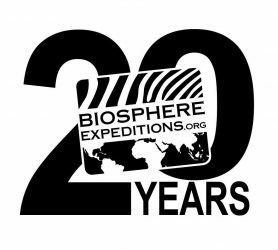 We have added quite a few more photos of our 2013 expedition below and to www.facebook.com/biosphere.expeditions1 | https://plus.google.com/103347005009999707934/ | http://pinterest.com/biosphereexped/. Thank you to Wouter Kingma (www.wouterkingma.com) for providing the bulk of them. Come and join us again in January 2014 if you can! I’m back in Germany as I send this and wanted to give you a quick summary of our achievements. During last week’s field work a total of 42 quadrants were surveyed, covering 200 of the DDCR’s 227 sq km. Three teams surveyed an area of 56 sq lm each by foot; set, checked and collected 12 live and 11 camera traps in total. Provisional results of species encounters are sightings of nine different species (excl. reptiles) such as Arabian gazelle, sand gazelle, desert eagle owl, lappet -faced vulture, Maqueen’s bustard, red fox and sand fox. The central group’s four camera traps took 56 pictures of the species above (and oryx, of course), seven more SD cards still need to be checked for results. The presence of Gordon’s wildcat within the reserve was proven so far by tracks only; we’ll keep you updated on the results of the remaining camera traps. As to the oryx survey, data of 24 oryx herds were recorded all over the DDCR, eighteen herds were sighted in the north, two in the central area and four in the south. Within a range between 0 to 5, the average condition scoring of individuals is 2, corroborating the DDCR scientists’ hunch that the majority of animals are malnourished. Steve is not surprised by this, because the whole desert ecosystem has been suffering from a drought over the last two years, but emphasises how useful it is to have so many oryx surveyed by us volunteers in a short, concerted survey effort. We would therefore all like to thank everyone involved in the project – first of all all the team members that have put in a lot of sweat and hard work in the field, but also our partners, sponsors and supporters. 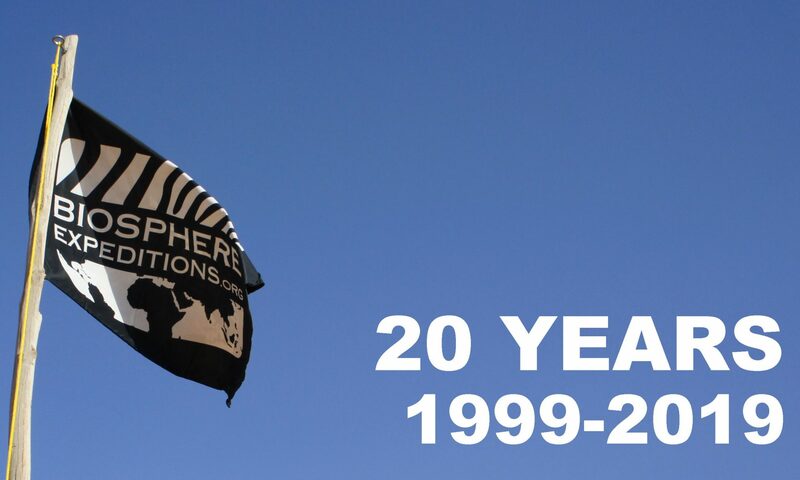 This conservation project wouldn’t be possible without you! We are looking forward to continue working in desert conservation and hope you’ll all stay involved. A comprehensive report will be published in due course. I’ve thouroughly enjoyed our time in the desert and hope to see some of you again some time! Today is the last day of our one week in the field… already! As I write this, the North, Central and South groups are collecting live and camera traps and later on will survey two last 2 x 2 km quadrants within their areas. 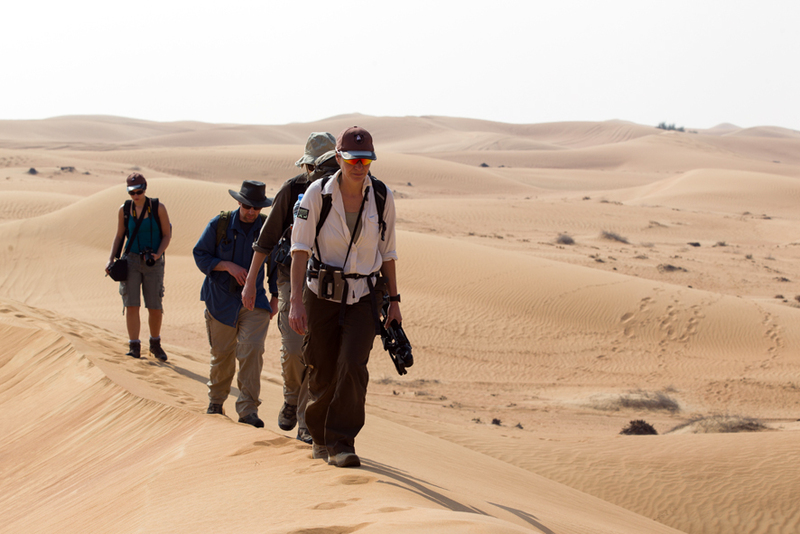 By this afternoon every team will have surveyed 56 sq km of varied habitats within the Dubai Desert Conservation Reserve (DDCR): sand dunes, vegetated sand dunes and gravel plains. This one week tour de force by our survey teams is an important annual survey benchmark for the DDCR that can only be produced through your hard work and dedication. Thank you everyone and long may it continue! During this year’s live capture week, no animals went into the live traps. More: not a single one of our twelve live traps was triggered druing their six nights out in the field. Was it bad placement, bad luck or, more worryingly a decline in species. Our camera traps will have to shed more light on the presence of nocturnal species such as Gordon’s wildcat, foxes, hares, etc.. Watch this space for more news and of course the full expedition report in due course. To bring things to a close today, Steve gave us all a review of the work done before we had our last dinner around the camp fire. 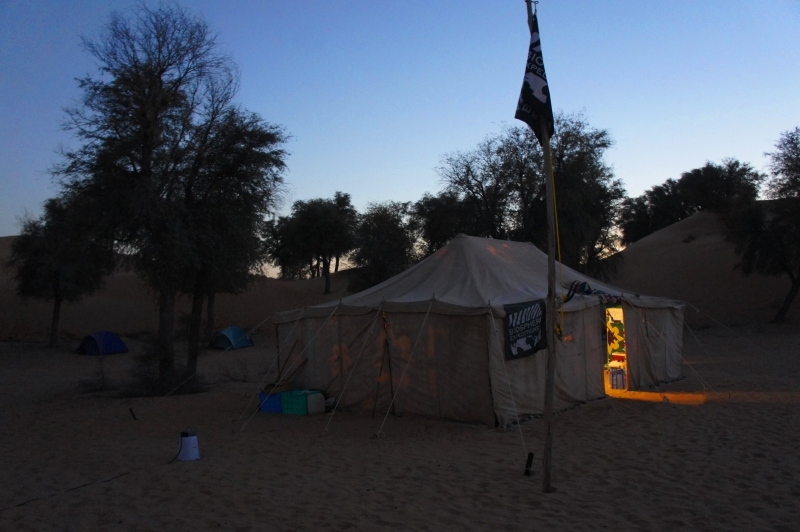 We’ll end this year’s desert expedition by having a drink at the Al Maha Resort later tonight…. Thanks again for all your help. I’ll send through any interesting camera pictures we get, as well as more pictures of the expedition soon. All is well in the desert! After assembly on Sunday, Monday saw the team being trained up on the use of research equipment, live and camera traps, datasheets, animal identification and oryx scoring (health status of individuals) as well as on GPS navigation… intensively ;). 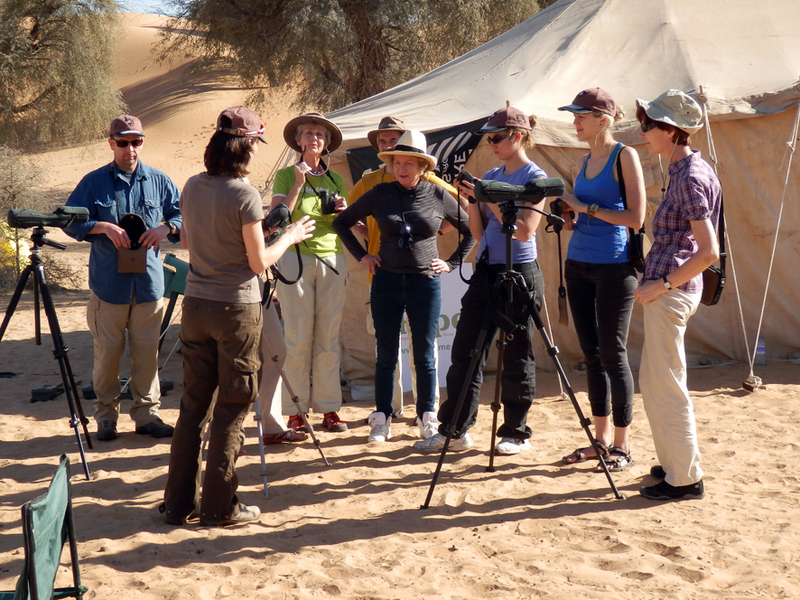 Training how to use the Swarovski Optik binoculars, spotting scopes and laser distance measurers to assess Arabian oryx health in the desert. 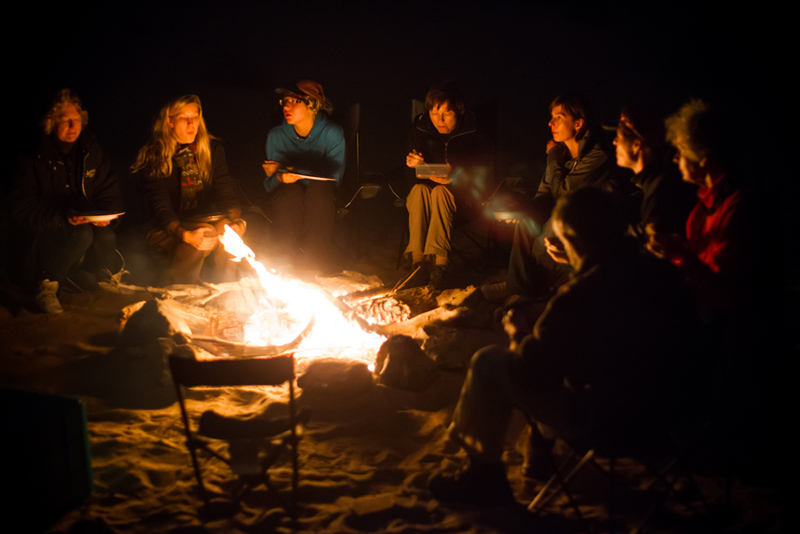 Ben, Lizzy, Liz and Hildegard went on their 4×4 desert driving course, whilst everyone else prepared and set up the camera traps supervised with Greg, the expedition’s chief scientist. Three groups went out to set a total number of 12 live and 12 camera traps in the field, each within their assigned survey area for the week (North, Central and South). From Tuesday onwards, the teams have checked the live traps every morning but unfortunately no capture… yet. After the trap checking, we go on desert survey walks up and down the sand dunes. Three quadrants of 2 x 2 km are surveyed per day per team. This may not sound much, but is actually hard work and we suffer for science here 😉 The South group (Bernhad, Hildegard and Liz) encountered gazelles and a few oryx and were lucky to spot an eagle owl. More oryx herds were found in the Northern parts of the reserve, with Lizzy and Sokolov assessing the health status of a lot of oryx individuals and also spotting a ringed Maqueens bustard. Alex, Irmtraut and Ben and I (Central group) did not spot a single oryx within our quadrant despite scouring the beautiful landscape for hours. We did, however, come across mountain and sand gazelles on our trek through the desert. The camp’s up, the shopping (mostly) done, we have one 4×4 (picking up the other one tonight), we have a cook (crucial) and we have our datasheets and work plan (crucial too). 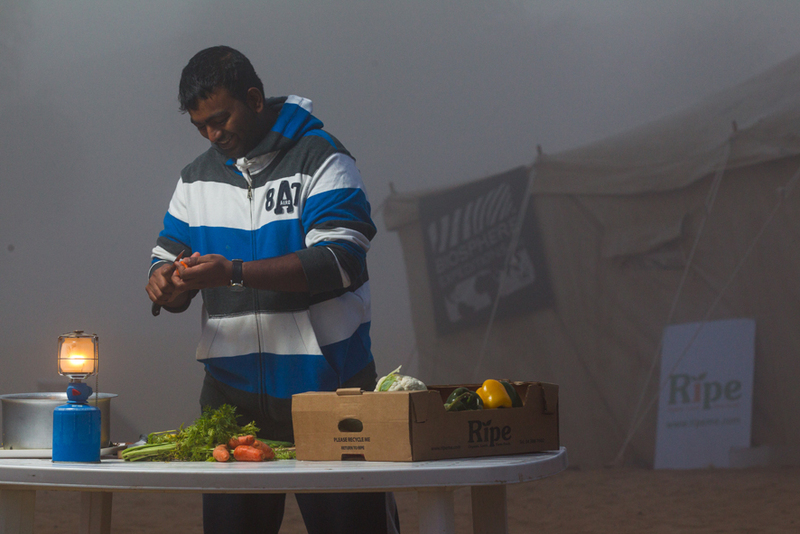 Our cook Thaya has scrubbed all the pots and pans and is ready to work his magic. We went shopping yesterday and I am glad he was with me as I would have been lost in town without him. 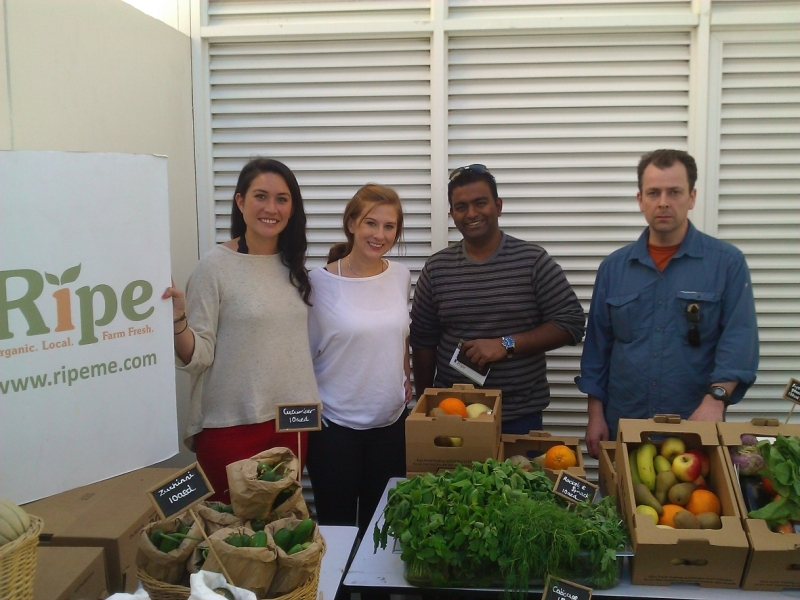 As you should know from the dossier, we only serve vegetarian food (see http://www.biosphere-expeditions.org/policies > tab “Food” for the reasons) and we’ve recently had support from ethical food provider http://www.ripeme.com, so going to their store with Thaya (second from right) and selecting food was fun. The guy on the right, by the way, is your fellow team member Ben who was here early, kindly helped out and can smile if he wants to ;). The two on the left are Pamela and Carol (sp!) from Ripe (thank you Ripe!). No points for guessing who is behind the camera. See you all tomorrow at the Permier Inn! I am just packing the last bits and pieces and have put a video diary up (as a test of who actually looks at this stuff ;). Enjoy. 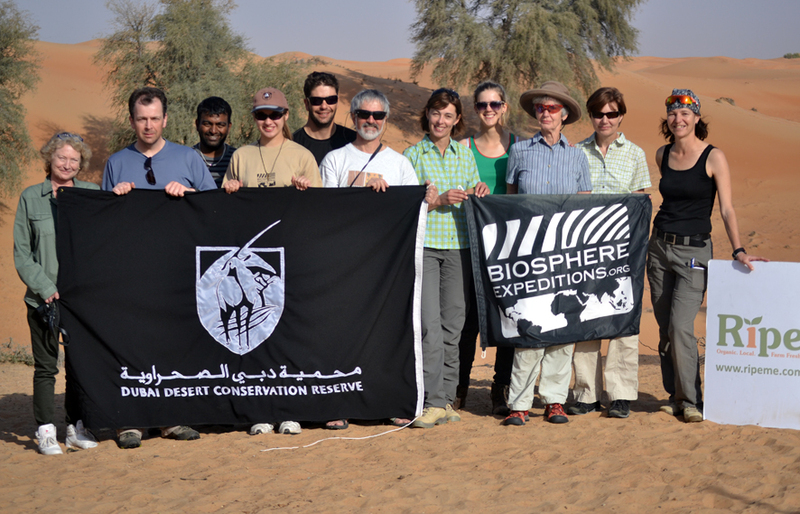 Hello everyone and welcome to the first diary entry for Biosphere Expeditions’ 2013 Emirates desert expedition. My name is Malika Fettak and I will be your expedition leader. You will also meet Greg Simkins, Steve Bell and Pete Roosenschoon, from the Dubai Desert Conservation Reserve (DDCR), as well as a host of other people, whom I will introduce to you as things progress. I am still in Germany getting ready for the expedition and then I’ll be about a week ahead of you arriving in Dubai on 15 January. My number there should be [removed from online post for privacy reasons] and I will confirm this again once I have landed. Remember that this is for emergency purposes only (such as missing assembly). Once in Dubai, I’ll organise the cars, cook, food, camp, equipment, you name it. so my luggage, apart from a few pieces of clothing, looks like this. 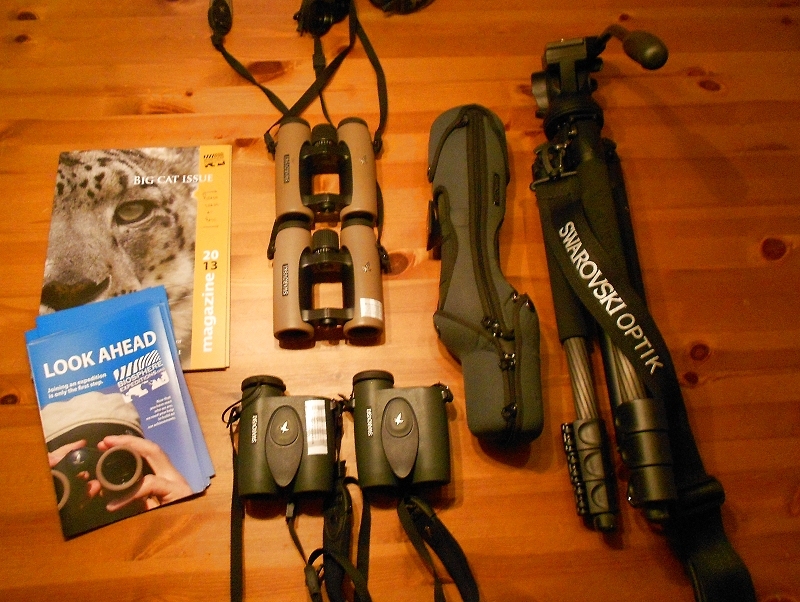 Spotting scope & tripod (the long things) are for looking at oryx bottoms (all will be revealed on site), as are the binoculars. The swish laser rangefinders (squarish things at the bottom) are for measuring the distance between yourself and the oryx bottom in a very accurate, sciency way. Have you seen the expedition summary video we put together a while ago? Have a look below to get you in the mood. There are a few good-looking oryx bottoms on display too. P.S. And as I pack my bags, news comes in of an accolade for our forthcoming expedition, which is named on today’s The Independent’s “Best Desert Adventure Holidays” list.